Auburn’s national championship team are, from left: Isaac Jones, Laura Croom, Meghan Helmer, Emma Crowley, Cecelia Chapman and Travis Sulfridge. 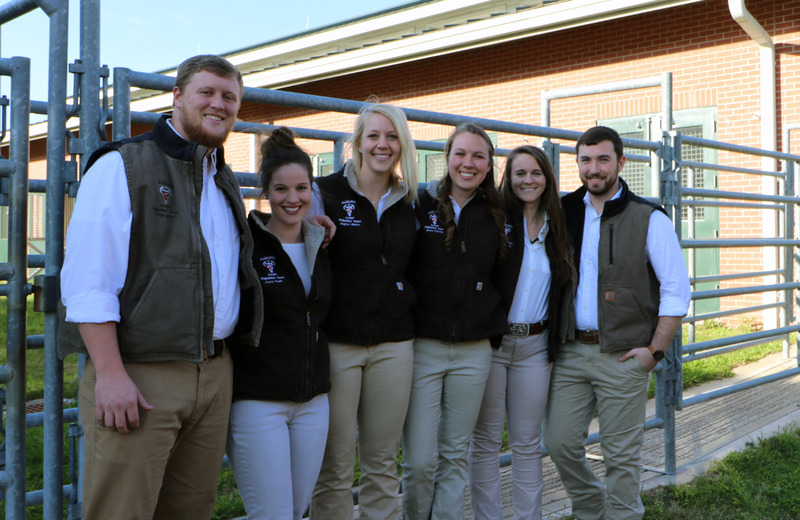 Auburn’s College of Veterinary Medicine students won a national championship by taking first-place honors in the Student American Veterinary Medical Association’s bovine palpation competition at the 2018 Student Symposium held at the University of Pennsylvania. “I’m just incredibly proud of them. They’ve worked extremely hard this past year, and their achievement is a great culmination of all their work,” said Dr. Julie Gard, a professor in the Department of Clinical Sciences and the team’s advisor and coach. The team was one of 11 which competed in the national competition sponsored by the Society for Theriogenology. Since 2000, Auburn’s teams have placed first in 11 symposiums, the most of any veterinary medical program. The competition is conducted in three sessions over three days: a written exam about palpation, a lab practicum where team test their fetal aging and pregnancy diagnosis skills. The top five teams moved on to the final judging of their palpation skills on a live cow. Jones and Croom represented Auburn in the palpation portion of the competition. Croom tied for first place in the individual palpation contest. Sulfridge had the highest score on the written and tract portion combined and Emma Crowley was second. The team captain was Helmer. “We really worked together as a team and we brought different skills to use to get us to the final round,” Crowley said. “All the students were integral in winning the competition and we’re proud of their accomplishment for the college and Auburn,” Dr. Gard added. Helmer said the competition was stiff, but that it started with their own classmates over a year ago and continued into the national competition. “As soon as the previous team completed the competition, we started practicing and dedicated ourselves to challenge each other. Auburn’s winning team was assembled more than a year ago, through a stiff test competition at the college. The students have practiced as a team for a year, both as a group and individually. To be a member of Auburn’s team, students are required take an elective course during their second year, “Advanced Large Animal Reproduction,” instructed by Dr. Gard; be a member of the American Association of Bovine Practitioners; and have the top scores on a written exam. All of the team members are in their third academic year of the veterinary program. Auburn’s College of Veterinary Medicine is internationally recognized for its theriogenology, or reproduction, program. The program was started with veterinarians like Dr. Robert Walker and Dr. Robert Hudson and carried on Dr. Dwight Wolfe, Dr. Gatz Riddell and the late Dr. Bob Carson. Auburn veterinary medicine continues the tradition of outstanding faculty with the current farm animal theriogenology faculty members: Dr. James Wenzel, Dr. Julie Gard, Dr. Misty Edmondson, Dr. Herris Maxwell and residents Dr. Jessica Rush and Dr. Humberto Nobre.